10:00 AM to 5:00 PM both days! "The City of Friendly People" invites you to the annual Hogansville Hummingbird Festival, held the third weekend of every October in historic downtown Hogansville, GA. Our Main Street will be bustling with food, crafts, antiques, music, local artists, local shops, and activities for the whole family. Two days of old-fashioned family fun! Includes easy parking, handicap access, ample security, and kids play area. Vendors and sponsors welcome! Free parking. Free admission. Full size food court. Live music. Our excellent local restaurants are open too! "For years, Piedmont Newnan Hospital has been a cornerstone of wellness in Newnan, Georgia, providing high-quality, comprehensive healthcare. In 2012, Piedmont Newnan expanded to better meet the needs of Coweta County residents, opening a state-of-the-art 362,000 square-foot, 136-bed hospital." When you go in for care, be sure to thank the Piedmont Newnan staff for their generous support of the Hogansville community. 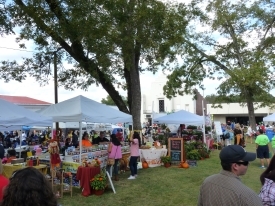 The 2019 Hogansville Hummingbird Festival is an outdoor Festival for the whole family, to be held Saturday and Sunday Oct 19 and Oct 20 in historic small town Hogansville, Georgia. The Hogansville Hummingbird Festival is a true small town festival, featuring 200 vendors, food court, live music, kids area, artisan crafts, and more. All proceeds benefit the Hogansville Charitable Trust. To find the downtown Hogansville area on a map, use the address 400 East Main Street, Hogansville, GA. The Hogansville Hummingbird Festival committee has selected the artwork to represent this fall’s Hummingbird Festival. 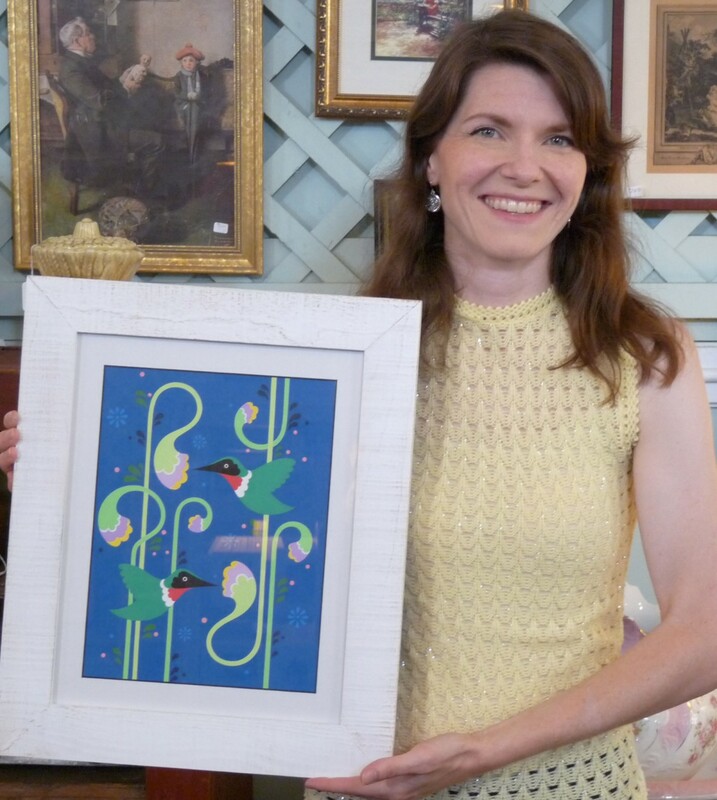 Out of a crowded field of 30 submissions of original art, Elisa Dallas’s painting of two green, ruby-throated hummingbirds on a blue background was the winning entry. Dallas’s acrylic painting, with its geometric lines and elegant flowers, evokes the Art Deco or Art Nouveau style of art. The winning art each year is used in the designs for the Festival T-shirt, poster, and guidebook. You can view the resulting 2018 Hummingbird Festival poster in the Poster Gallery. Elisa Dallas’s original framed painting will hang in City Hall downtown, along with the works of art of previous Festival artists. Dallas shares her art on a artist website and on Instagram as elisa.dallas. The Hogansville Hummingbird Festival, 2019 being its 22nd year, is the principal fund-raising vehicle for the Hogansville Charitable Trust, a 501(c) 3 Georgia non-profit corporation whose stated purpose is the renovation, preservation and improvement of historic and municipal properties in and around the City of Hogansville, Georgia. The Festival has raised in excess of $325,000 for this purpose. However, by using these dollars primarily as matching funds for Federal, State and other grants, the money has been leveraged into more than $3,000,000 in improvements for the City. The projects have included renovations of the historic Royal Theater, now used as Hogansville’s City Hall, three phases of StreetScapes and construction of the Tower Trail which includes a walking trail from Hogansville Elementary School, by the historic Water Tower, and ending on Oak Street by the City’s now retired water treatment plant, and an outdoor classroom. In 2016, the Charitable Trust purchased land in the center of downtown, which has since been donated to the city and named Askew Park. This preserves greenspace for our beautiful historic downtown. In 2018, the Trust made another large purchase for the benefit of the city, this time the PNC Bank building, which is being donated to the City of Hogansville with the intent of using it as a new City Hall. 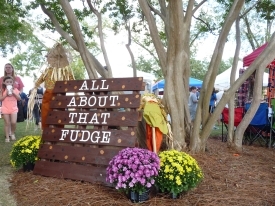 In addition, the Festival has donated to such charities as the American Red Cross’ Katrina Relief Fund, the Shriners Hospital, the Boys and Girls Clubs of West Georgia, “Breast Friends for Life,” a Troup County support group for breast cancer patients, Hogansville’s GED program, and “God’s Bread Basket,” Hogansville’s Food Bank. The Hummingbird Festival takes pride in having a well balanced, diverse, and high quality group of vendors offering quality goods that cannot be found just anywhere. Many vendors choose to come back year after year, but we are always interested in meeting new people. Please visit our Hogansville Hummingbird Festival vendor information page. Be sure to also find us and Like us on Facebook. We try to cross-link on Facebook to as many vendors as we can during the lead-up to the festival. The Hummingbird Festival is a 100% volunteer-driven, community-supported fundraiser for the Hogansville Charitable Trust, a registered non-profit entity that supports Hogansville community improvement projects and programs. As you can see on our Festival Sponsors Page, we are proud to have the support of many businesses, organizations, and individuals, large and small. 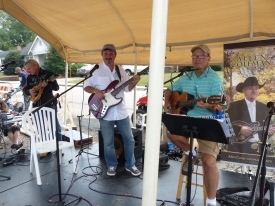 The volunteer efforts of dozens of people from the Hogansville community, combined with the funds raised throughout the festival season, combine to create real leverage for the Hogansville Charitible Trust to do good for the City of Friendly People. Click here to download a 'sponsor fact sheet' (PDF file) and find out how you or your organization can be part of the Hogansville Hummingbird Festival! We always need volunteers! For jobs small, medium, and large--before, during, and after the festival. Something as simple as helping out in the food court for a couple hours or driving the parking shuttle bus can make a big difference. For more information call Mary Stewart at 706-333-2520. Looking for information about hummingbirds? Check out Hummingbird Central.